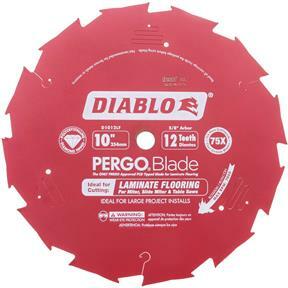 Diablo's new 10" 12 TPI PCD tipped PergoBlade is the first blade specifically designed for cutting laminate flooring in a chop saw application. 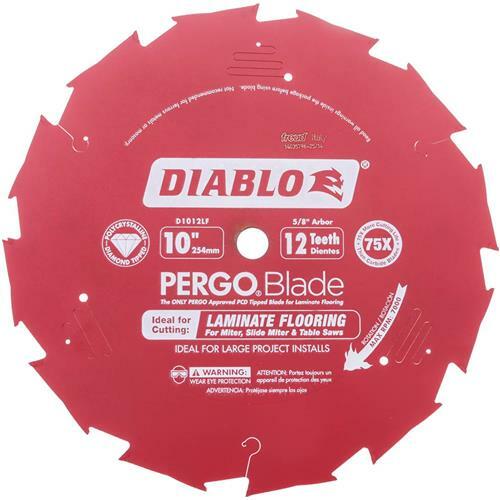 With 75 times the cutting performance compared to a carbide-tipped saw blade, the PergoBlade is ideal for cutting various types of flooring engineered hardwood and bamboo. Polycrystalline Diamond (PCD) Tooth with unique tooth geometry delivered unmatched cutting life and hi-tech anti-kickback design re-enforces the tooth for longer life. Anti-vibration design to reduce vibration and stabilize the blade while perma-shield non-stock coating protects the blade from heat, gumming, and corrosion. Arbor size 5/8".